Tark Charoset is the commanding Sindareen Officer in the Gateway Sector, overseeing all Sindareen operations in the area. He is considered the proverbial face-man of the Sindareen in and around the Gateway Sector. 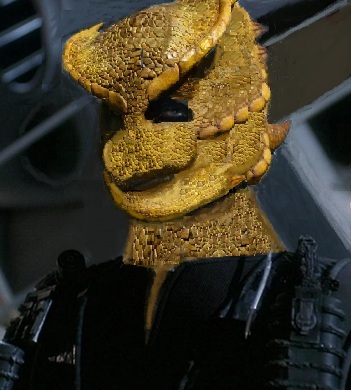 He resides at the Sindareen outpost on Forever World and commands the Warship, Karpas. Charoset is a ruthless man, greatly feared by others, including his subordinates. Having displayed extreme savagery in combat, no Sindareen dare challenge his authority. But despite his aggressive nature, Charoset is quite clever, and not easily outwitted. He is a formidable adversary. Not particularly loyal to Doyan Maror , Charoset has made decisions that favor himself, without seeking Maror’s approval (and most likely his wishes). He cares very little for the lives of others, including his own men. He commands without compassion, kills without mercy, and is apathetic to death, including his own. A masterful tactician, Charoset has led and won countless engagements against various enemies. He is considered an expert in Sindareen combat, both hand-to-hand and with various Sindareen weapons. He loathes Cardassians, and deliberately seeks trouble with them.